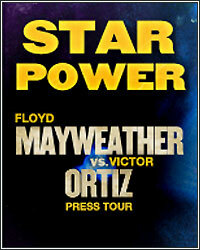 Don't miss the live broadcast of "Star Power: Mayweather vs. Ortiz Press Tour". On Tuesday, June 28, at 11:30AM ET/8:30AM PT and Wednesday, June 29, at 10:30PM ET/7:30PM PT, fans can watch the entire broadcast of the New York and Los Angeles press conferences officially announcing the September 17 clash between pound-for-pound champion Floyd Mayweather and WBC welterweight champion Victor Ortiz. Check back at the respective starting times for the broadcast courtesy of Ustream.com.